There is a huge demand for Professionally managed photography service in the Event space and YKR Photography has decided to step in to cover all the Corporate Photography event needs. YKR Photography is one of the best photography in Bangalore, India. We offer complete end to end solutions for all your photography requirements. NO matter what it is…’ONE STOP’ solution for all your photography needs. Since not everyone can afford to Own heavy budgeted Photographer’s for their occasion or events. Based on the requirements and demand from customers and clients we have introduced Our Exclusive Photography package at feasible prices. However our aim is to full fill the need of every individual who wants to enjoy photography services at any location at pocket friendly cost. 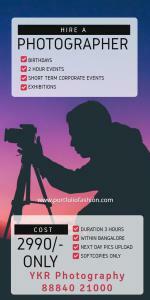 Hire a photographer within Bangalore for BIRTHDAYS, TWO HOUR EVENTS, SHORT TERM CORPORATE EVENTS, and EXHIBITIONS. Our top priority is that every customer/client gets the best quality service, professional result, and breath-taking output. Our Team of YKR Richie is one of the best Super flexible Photographers that makes it easy to get your shoots done at a very comfortable zone. Kaalia Modelling Agency signs up Walter as their Fitness Model from Bangalore.